Why read the article when you can read the thread instead? Although it is the product of my imagination, the following “conversation” was inspired by actual comments posted in response to several online news stories about the Bureau of Land Management’s (BLM) recent, controversial roundups of wild horses and burros on public lands in Nevada. Some folks feel passionately that these BLM horse “gathers” are inhumane, while other wild horse advocates go further, arguing that the roundups are unnecessary because horses are a natural part of the western landscape and should thus be left undisturbed. On the other side of the argument are people who see wild horses and burros as introduced, invasive species that damage the range, putting native plants and animals at risk, and risking their own destruction through starvation or dehydration. While palatable solutions are difficult to come by, this “conversation” gives some sense of the quality of current public discourse on a topic that is especially important to those of us who live in the rural Great Basin Desert. Wild horses in Nevada. Photograph by Flickr user ScottSchrantz. sweetpea: Look, guy with rude name, I’m just saying that Nature knows what to do and we humans usually just mess that up. Besides, how can it be NATURAL to exterminate nature? 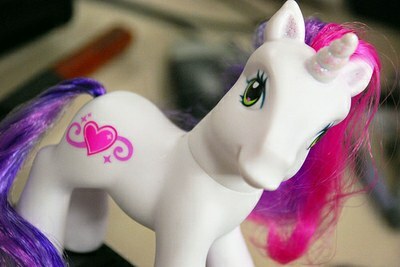 One of many My Little Pony toys in the world. Photograph by Flickr user Lisa Brewster. endtaxesnow: “Nice one, inmycrosshairs. Did you know you can tell where your horsemeat comes from by examining its DN neigh?